Skype is on the Iphone as of today! What is Skype? Skype is a software that allows users to make telephone calls over the internet. Calls to other users of the service and to free-of charge numbers are free, while cost to other landlines and mobile phones can be made for a fee. Additional features include instant messaging, file transfer and video conferencing. Geeky Shoes. Cool or Not? When we talk about shoes, How do we relate technology into the equation? Sounds like and odd understanding. When I was younger the only technical aspect I was aware of was the Reebok "Pump" basketball shoe. On the tongue of the shoe you would be able to press air into the surrounding shell of the shoe to give the player a better formed fit and to make you perform better or jump higher which was never scientifically proven. There is also the NIKE Air bubbles that became fashionable in the 90's too. Fast forward to the future of today and shoes and technology is continuously evolving. In this Geeky Shoes (link) shows different running shoes with different technological uses. Some of the examples cited when you visit the link above range from an mp3 player with wireless sound system on the actual shoes. A pedometer that can also be fitted into a shoe. The combination of Nike and Ipod sport kit is a perfect example of this "Geek Style". For any avid shoe collector, one pair of Air Force 1 Custom shoes is the "DIGG" glow in the dark version. If you are not familiar with the DIGG website. It is basically a ranking website that is popular for letting you know which websites are most popular by different categories. Only 6 pairs exist and are based on the same colours as the actual website of DIGG. The neat thing about these shoes is that they actually "Glow in the Dark" with a Digg pattern. Included in the links are also, NES video games,Tranformer shoes and shoes with GPS. Interesting technology I must say. Welcome to another Freedom Friday! As usual I post a funny or interesting video to end the work week. This one pokes fun at Twitter. This cartoon has gone viral and is still making it's way through the net. Enjoy and have a great weekend. I've only started using Twitter this year but it has proven valuable to me so far and I'm still enjoying the use of this internet application. Twitter has been around for 3 years now and seems to be the talk of the town quiet literally. So many people ask me "What is Twitter ?" or "Isn't that just a status update like Facebook?". These are difficult questions to answer because it all depends on how you use it personally. For me it's all about connecting with people who may share the same ideas or interest as me. It is also helpful for networking in a particular field or industry or to find out and answer to a question you can pose to your "Followers". If you look to the sidebar on the right of this page their is a badge for "Pay It Backward Day". I happen to click on their link through Twitter and find this upcoming event and website interesting, especially since it is based in Toronto. The premise of the site is quite simple. This site inspires you to do something good for someone else. On April 4 they will try and create the world record of 490 "pay it backward" coffee buys in a row. It's a great idea because it gets the community involved and it's make you a part of doing something good. Isn't this what social networking is all about. So this event has come about through the DailyChallenge and Twitter. For posting this badge I will have my blog address posted on their website, so it also helps me with SEO and recognition as a blog that talks about technology and how it affects the world, just like this event. So this article is my way of "Pay it Back" to them. If you are in the Toronto area on April 4, go check it out and get involved. This morning I was booking a flight for Las Vegas. I had booked it via the internet but I came to the realization that I had to input my password for different options multiple times. They say the internet is quicker and faster. This is true but it is still annoying to have to enter your password so many times. I will follow up with examples of this password problem in general. You require a password to access your email. You need to change your email password every month. If you have multiple email accounts like I do then the password memorization becomes more difficult. You pretty much need a password for almost everything on the internet now. A password for your AirMiles,Aeroplan,telephone,Cable,Applications,Upgrades,Government,Credit Card the list can go on and on. You get the point here. Having to memorize different passwords is difficult. Most passwords always have to reset for a set time which even makes it more difficult to remember. I know everyone has the same problem because the internet has taken over our lives now. It would be interesting to find a simple and easy solution. Hopefully this new application called "1Password" for mac will do me justice. Here's is a link for the site 1Password Hopefully someone can tell me if this is a good application to use. If you have been living under a rock lately much talk has been about the economy and how it has affected everyone especially in the states. Every question will be ranked on the website in which Obama will answer all the top questions at a later date. This is brilliant because he will be able to find out what is most important to Americans. He will be able to see patterns so he can adjust his political agenda accordingly. Transparency is the key here. Obama is making sure that everyone has a say in this new government. He is not hiding anything so if he makes a mistake, it's all for everyone to see. If he passes a law that is good, it's because all American s thought it was the right choice. So building trust with his American people is developed. Canada should adopt some of these techniques. Canada is so technically advance especially in the big cities that we should embrace and implement similar procedures and tactics. Obama using the Internet is a reflection of how Technology can affect change. Social change is occurring through the net. You can basically create change from the seat of your home and that is very powerful even though it doesn't seem that way. I can already predict in the future that everyone will be able to vote online as opposed to going to a polling station. Government officials always complain their may not be enough voters coming out. The Internet may change this in the future to come. Now all you americans should go and post a question on the economy, while us Canadians sit back and watch it unfold. I wonder what the top question will be. I was reading an article this morning from the "The Globe and Mail" in regards to the future of cellphones(Source fromGLOBEANDMAIL). The history of the cellphone use to be analog and now it is currently 3G. 3G by definition is the third generation of telecommunication hardware standards and general technology for mobile networking. The article goes on to explain that the future of cellphones will be 4G. 4G is know as the next complete evolution in wireless communication also known as "Beyond 3G" .Researchers are already developing technology for the future of cellphones. Cellphones today are used for text messaging, watching video and also to voice communicate. The future of the 4G will bring about faster download speeds. High definition video conferencing and also the introduction of 3D on the phone is what the future will be. Richard Scoble known as "Scobelizer has predicted and only a matter time before HD comes to the phone. Imagine being able to conference live with a friend or business partner in real time live HD. Speculation is that this will arrive in 2015. How are they able to do this you ask yourself? Currently 3G uses base stations. The farther away you are from the base stations the weaker your signals are for your phone. If you ever notice when you go up north or somewhere isolated that seems to be the pattern. The introduction of 4G would basically continue on the same premise of base stations but with more smaller base stations or "Relays" positioned more frequently around such as lightpost or building rooftops. This will enable faster transmission of information. The cellphone is already the main communication tool that is usually called the smartphone. It will be interesting to see how the cellphone will evolved from today. Can the smartphone really outsmart itself with the future of 4G. I'm already enjoying the iphone and cannot believe it's only going to get better. Who needs a computer anymore. As the warm weather approaches here on the east side it's time to get back into shape and add a little fitness regiment. compartment. There is a "Anti-shock" mode and a "Blower" mode which makes blading more comfortable and easy. The result would be less wear and tear for the joints and better ankle support. Availability of these rollerblades are undetermined. Lookout for them in the near future. In the heat of March Madness a friend, "Mr. Currie from Jersey" alerted me of a new application for all you March Madness basketball fans. This software only works on WI-FI but you can stream the video from every game, live from your iphone. The cost is $4.99 and the application expires on April 6th, 2009. So if you are a baller go get this App now. Go North Carolina!!! 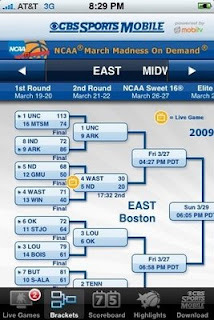 It's called CBS Sports NCAA MarchMadness On Demand. What is VNC ? VNC stands for Virtual Network Computing. VNC allows one computer to remotely control another computer. Some popular uses of VNC is for schools or technical support. As an example, an instructor in a computer here in North America can control a desktop in China or anywhere else for that matter. VNC Lite is free for the iphone. You can purchase an upgrade that also allows more functionality at the App store. The iphone can also be considered a computer but there is nothing better than to be able to see your own desktop at home from anywhere with your iphone. This works through WI-FI and also 3G. You can control and move everything on your home desktop from your iphone. You basically have your computer with you everywhere you go. Keep in mind that it is very slow especially if your connection is not strong. I like to use this software to monitor "downloads" which I may have queued up for torrents or music( mp3's) to see the progress. This is just one cool application I highly recommend to users because of it's "Cool" factor and also because it's free. We all like FREE, right? This application can be downloaded right from your iphone or at ITunes App store. This will also work for both MAc and PC. It was also very easy to set-up with instructions. The whole process took me less than 10 minutes to install and use. Thanks again to all my readers and viewers of this blog. In a continued format I will showcase a funny or interesting video every Friday to end the work week. Since it's the 1st day of Spring and March Madness basketball is in the air I thought I would showcase this clip that I actually got through Shaquille Oneal's twitter feed. It's titled "BEST DUNK EVER" with no video editing or camera tricks.Enjoy and see you all on Monday with a new post. Time magazine lets readers choose. Time magazine is one of the most regarded and popular magazines in the world. Now they will be experimenting with a new way to sell the magazine and it's content online. They plan to experiment with a customized magazine that is viewed on the internet. It is called "mine". Readers can select five titles from eight titles under Time Inc. Editors will preselect the stories that make it into the online issue. One of the major sponsors for Time is Lexus. Lexus is joining with Time to promote a Lexus 2010 RX sport utility vehicle that is as customizable as the magazine carrying it's ads. This can be a glimpse into the future of advertising relationships between publications and advertisers. Watch new movie trailers on Twitter from Apple. OK, you can't really watch video in Twitter but you can have links to upcoming movie trailers sent to you. The reason this is newsworthy is because Apple has always been known to showcase movie trailers on their own website. Most people would come to the site and view various trailers. Now Apple has decided to go the Twitter way. They are now updating and posting movie trailer "Tweets" as new trailers arise. This is very unlike Apple but this tells you how they are changing the way we view things on the Internet by using "Twitter" to showcase the trailers. Apple is now coming to us. This could be foreshadowing how other companies will use Twitter. Various companies such as ZOOCASA which is a home search for real estate or rental property are now using Twitter to post available property or listings. So it should be interesting to see how Twitter evolves in the near future. I personally think that Twitter will change once it hits full mainstream. Is that a good or bad thing. That's the question everyone wants to know. You can follow Apple Trailers at @itunestrailers on Twitter. Yesterday, Apple had an advance preview of the new iphone OS 3.0 software that should launch sometime this summer. There is a lot of anticipation for developers and users of this smartphone from Apple. The iphone has changed the way people communicate and use the phone. Apple is the first to showcase a touch sensitive screen and built in accelerometer. An Accelerometer detects the movement and changes the display accordingly or control a game using only your movements. Some of the big changes coming to the iphone is for the developers of software for the Apps store. Most iphone users can download applications for a small cost or sometimes even free. Apple has introduced subscription service so now developers can charge more than just once when an app is purchased. For example if you buy a video game from the App store and you play the first 10 rounds and you complete it, you can have option to purchase the next 10 rounds with a pop window that appears giving you the option to purchase more. For regular users of the iphone the option of "copy and paste" will be introduced. Also the use of multi gaming with other users on an iphone for a new way to experience gaming on the phone. Now this is just a small sample of the many changes coming to the iphone but we can't forget about the other phones more specifically the "Palm Pre". Remember the Palm Pilot and how everyone was using a stylus pen to touch and navigate the screen to create the most advance organizer. Palm has introduced the "Palm Pre" that looks very similar to iphone and also has a touch screen and also a QWERTY keyboard. Take a look at the video above and tell me what you think of this phone. Some of the things I wish the iphone would have introduced was a better camera and video option. We will just have to wait until they release software 4.0 if that option comes from Apple. Until then I'm going to keep playing on my iphone. Have you ever taken pictures with your digital camera for a birthday party or take pictures at a concert. We've all taken pictures at one point or another. You go home and tell yourself that you will upload the pics in the next couple of days but you actually find out you don't have the time to upload the pics because you live such as busy life. So the next time you take your camera out to take pictures at your sister's wedding the card is almost full from previous outings. I'm sure we all know that feeling. Now with Eye-Fi the worries are gone. Eye-Fi looks just like any SD card for the exception that it has a wireless chip built inside. You can use this card in a digital camera and take pictures as you would usually do. Once you have taken your pictures you go to your laptop or computer that is on a wireless network and it will automatically transfer your images to your computer or online photo center such as Flickr or even Youtube for videos. This saves you time from having to wait minutes and minutes downloading pictures to your computer. This free's up your time to do more important things than wait by your computer. Eye-Fi also has a Free App for the iphone which allows you to WI-FI your pictures on your Iphone directly on your computer. You will need to purchase an EYE-Fi card to register for this service. The Eye-Fi is available in the States but limited in Canada. They are approximately at little more expensive than your average SD card but for ease of use and the time saved I think it's worth it. They usually come in 2 GIG and 4 GIG models. The price range is $50-$100. I will give you an update on this Eye-Fi card to tell you how fast or slow this process works. Until then check the site out here with a cool video of it's simplicity on their website. I remember when I was a teenager I would have to wait in a long line to board the plane with my passport in hand. I would board the plane and listen to safety instructions on a snowy tv screen with bad sound quality from these cheap earphones given away free by the flight attendant. The total flight would last like 5 hrs; not knowing what to do with myself since I've finished reading my magazines and books on board. Fast forward to the present and the airport and airplane experience has definitely changed for the better. On your way to the airport you can already print your tickets from home on your printer prior to boarding. They also have curbside check-in, so you don't have to lug your luggagae around the airport. Check-in is fast and convenient and is completed through a touch screen and a quick swipe of your passport. As you are processed and make it through airport security you are waiting in to board the plane. During this time you have access to WIFI and in some airports you get free internet connection such as Japan's airport. Once you have boarded the plane they have monitors behind each seat that have music,television and movie selections. Remember those safety instruction videos for you safety on the plane. They now have that on the screen in clear view for you to watch as many times as you need. 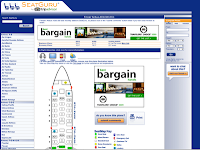 The monitors also tell you have far or how much travel distance is left in your trip. You may also plug in your laptop or charge your iphone on the plane which makes business travel even an easier thing. Travel for me brings joy because it always mean vacation for me. The total experience from the airport and airplane just makes your trip an even better experience to remember. The air carrier referenced in this post is Air Canada. The video below is an example of a new business class airlines called "Porter" which is not affiliated with Air Canada. In a continuing series on every Friday I like to post something funny or something out of the ordinary. This week from the "TED" conference it has a focus on a sixth-sense. This would be an interesting concept and future for technology. Please remember to feel free to leave comments or suggestions. If you don't want to type so much leave a voice recording just to the right of this blog post. Listen to what others have said just by clicking on the tabs. What is Google Alerts? You probably never head of it, right? You only know how to use Google to search topics that you type into the Google website. Why make your life more complicated. Let the web do the work for you. How do you do this? You can do this by using Google Alerts. Google Alerts are email updates of the latest relevant Google results based on your choice of query or topic. In simple terms, you type in keywords you would like to have Google "search" and Google will email you directly whenever that keyword is used on a website, blog etc. Let's look at one example. Let's say I have an interest in a particular celebrity; in this case I will choose "Coldplay". I want to know everything about Coldplay like when the next concert is going to be held, new stories about them basically anything about the music group. I log in to the Google Alerts site and type in the Keyword "coldplay". I have the option to have Google find the term in just blogs, news sites or just have it search everywhere on the web. All this info will be sent to me directly into my email. You can see how this is useful for other things like following your favourite sports teams or even keywording your own name. You will be able to see whenever anyone is using your name on the web because you'll receive an email stating the location of where your keyword was used. This is also a great way to keep current on a competitor or industry. This is an interesting way to control and make the web work for you. I found this website called Common Craft. This website is basically run by a couple from their home. They have become very popular because they explain various things in a very simple way as the video shows above. They explain technology or any other internet related topic in a more simple cartoon/graphic way. If you ever need some training or need of learning about the net go check them out. Go to Youtube and type in "CommonCraft". Cydia is not about pirating applications. It's about applications that Apple would never approve. In someways Apple is limiting the the progress of developers with their slow approval process. Th Cydia store allows developers to quickly launch apps so it doesn't limit users. It should be interesting to see how Apple reacts to the new Cydia Store. Possible copyright and strict lawsuits may come in the near future for Cydia. Only time will tell. To follow more on Cydia Store, follow the creator of Cydia Store on Twitter as @saurik or go to @iphoneschool. Here is a short clip of Chris Bosh from the Toronto Raptors using Twitter and Facebook. It is interesting to note that many celebrities and politicians have been using these applications. Some politicians have taken some flack for using Twitter during important speeches. As an example an american politician began tweeting during President Obama's speech with the Congress. Is this showing that the politician was not paying attention to Obama's speech? This politician was voted to represent the people. So it make you wonder if it is a good or bad thing for politicians. I myself think it's a positive thing because it brings a bit more of transparency into the way our officials work. It gives us an idea into the way our celebrities and politicians think and react. As for athletes it seems like another interesting combination. Would you be happy seeing Chris Bosh twitter during a game while he is on the bench? Or would this be a distraction to his team and himself? Anyways that a topic that I'm sure will be discussed in the future as social networking sites become even more popular. It's interesting to note that Chris Bosh uses two phones. He uses Twitter on the Blackberry and Facebook on the Iphone. Lance Armstrong,Steve Nash and SHAQ are a few of the other athletes that are using these sites to interact with their fans. I begin by stating I'm in my mid 30's. The first time I used a computer was probably when I was in 2nd year of college. I was probably only in my late teens. The first computer I purchased was a PowerMac 7200 for you Mac addicts. At that time the computer cost almost $5,000. Spending that amount of money during that time was a lot of money for a Mac computer. The specs on the computer went something like this: 75Mhz, Maximum RAM was 512Mb and it used the floppy disk that held 1.44mb. Move forward to today and you can get a more powerful and faster computer for less than $1,000. The key change here is to see how fast and far we have come with technology. It is more evident with children today. I have a niece who is uploading videos and creating webpages at the age of 12. She isn't even in her teens yet. I also have a younger nephew who is already on the web and playing video games all day. 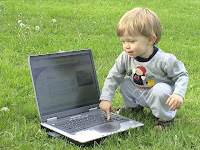 Can you imagine kids already using computers as young as 5yrs old. I didn't even touch my first computer until I was in high school. With the rise of information on the internet, learning for kids today will be different from how we were previously taught. For example, when I was growing up I had to memorize, I had to go to the library to find research for my projects. I had to carry so many textbooks to school from one class to another. Children today have a lighter load to carry around. Some may just bring their laptops to school. No longer do they have to go to the library since they can just "Google" the information they need. No need to memorize equations or formulas because it's all on the computer in a form of a widget. Learning for children has definitely changed. It's not about finding information anymore, it's more about controlling the information. Growing up with all this technology should have a profound affect on their future. Let's just hope it's a good thing for them. It's another Freedom Friday. Hope you enjoy the weekend. I have noticed lately that Twitter has been a little slow especially during "Retweets". The reason this could be happening is because Twitter is testing some new "Search" features on limited users. I always found that Twitter was missing a "Search" function on the main webpage. If you are using TweetDeck or any other 3rd party application they have a "Search" button which is why users are using these apps more than the actual Twitter website. Finally Twitter looks like they will be rolling this out soon to all users. It will also have a "Matching Users" sidebar and also a trending topics section. So you can now see what the popular tweets are at any given time. Twitter is making these changes just at the same time Facebook is changing the look of their site. Is this a coincidence or just great timing? Time will tell. 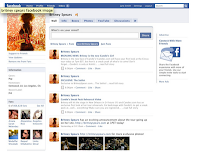 Facebook, the largest social networking website will have a new look very soon. Many users have been flocking to use Twitter so I assume Facebook had to react fast before losing market share. Facebook had failed to make a purchase of Twitter just recently too. The problem with these social networking sites is that it is very hard to monetize. For example Facebook has a very large audience but people using the site do not really view or click on the ads. As an example most advertising companies place a web campaign on a targeted website; like a newspaper website (New York Times). The advertiser knows how many page views they will get on any given time at the newspaper site. You basically choose when people see it. Social media like Facebook's website is totally dependent on the user choosing to view or read the ad. If the advertising is not relevant to the Facebook user it will not work. This is what makes it difficult for advertisers to measure. Also Facebook is Global and having a targeted demographic specific campaign can be more difficult for advertisers. Most marketing and advertising departments focus regionally and locally. Now this will have to change to reach a truly international audience. Getting back to Facebook's new look, it will offer some big changes. The mini-feed and Wall will be the new focus. Pages will now be able to share status updates (short blurbs). These updates will be visible on the Wall tab. Posting updates on your Wall will be automatically updated on your fans wall, which increases your interaction on your site and it is more viral. So if you post a funny video, or have a great link to a website. You will be able to spread to a lot of people in a short time. This is very similar to Twitter. So it should be interesting if most Facebook users will like this new change. Only time will tell. Skitch is the best Screen Capture for Mac. Sorry PC fans. For Mac users, we are use to using some sort of combination of Command Shift 3 or Command Shift 4 on our keyboards. With Skitch it works on the same premise but the beautiful thing about this application is that it allows you to annotate or mark up your screen shots with your own words. You can also resize your screen captures if you like straight from within the application, no need to go to Photoshop. For bloggers, this application is quick and easy to use. This is a free application but you must sign-up on the website, but you really don't have to use the site after signing up. You may use Skitch seperately from the site. Easy quick drag and drop functionality to post online or to email images. We all have used Facebook and I'm sure some of you are on it previous to visiting this blog or are viewing it at the same time. Here is an funny video take by TrplJayProductions (Julian Smith) on "25 Things I hate about Facebook". I'm sure we have experience at least a few of these nuisances of Facebook. It's funny how people would at first try to add as many friends to showcase how popular they are in real life. Or to your friend who would always have a status update every 5 min. (May I suggest Twitter..lol). Facebook has involved as a way to communicate for students to an ever evolving social network with various 3rd party applications. I wonder how Facebook wil look like in 5 years from now. As mentioned in my previous post, Twitter has taken off into the mainstream. Even though Twitter has existed for more than 3 years, it is only starting to really explode in the mainstream now that celebrities and major companies see the positive impact it has on the internet. Everyone is updating via Twitter, including the president of the United States to even Starbucks advertising special drink deals online. Twitter originally took off in Japan and is now being popularized in North America. Evan Williams, was the co-founder of Twitter and in this interview he explains the popularity of Twitter. Evan Williams was also the founder of Blogger which is the creator of this software I use for this blog. Below is the full episode of interview. Some of you may have noticed that Google has changed their logo on their web page today. It is to commemorate the birthday of the late Dr. Seuss, who has created over 60 children's books over the years. You can also customize your own Google page by going to this website at Change Google Logo. I thought this would be a cool prank to play on your friends on a Monday morning.